from the nato's: time for a sweet giveaway. and other kitchen-ee things. time for a sweet giveaway. and other kitchen-ee things. ok so speaking of kitchen-ee things, i bought these jelly jars the other day at the grocery store to use as drinking glasses. for some reason, i have always carried a certain disdain for the glasses i picked out on our wedding registry. they are simple and will never go out of style, but i don't know... they lack personality or something. i take that back, they lack my personality. and they show every water spot known to man. i think my new jelly jar glasses just say, sit down and have some sweet tea. or maybe guests will just wonder why they are drinking out of a jar. i don't care though. they are adorable and they are cheap-ola. 12 jars for 10 dolla-dolla bills. i am still thinking of something crafty to do with all the lids they came with. waste not, my friends. 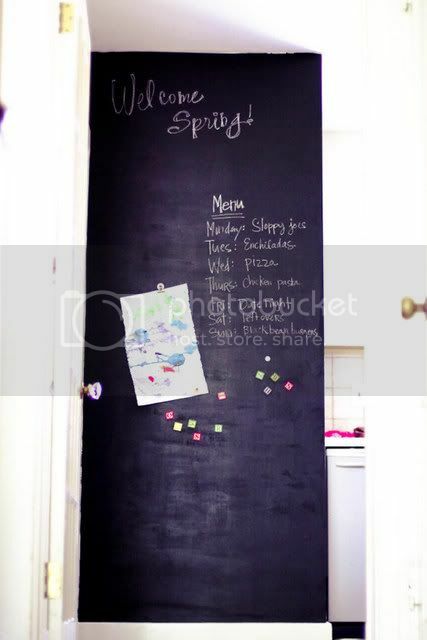 and i just finished this little magnet-chalkboard wall in the kitchen the other day. you know i have an obsession with all things chalkboard...so why not have an entire wall of this goodness? exactly. writing a menu on that wall totally makes me feel like i'm running a cafe. i guess, in a way, that's kind of what mom's do. i have to say, the magnet paint is expensive and you have to paint, oh, 8 coats of it to hold a magnet. then you have to put a coat of chalkboard paint on top of all those coats. it's basically a 2 or 3 day operation. but just like having babies, you surprisingly forget about the labor once you see the end product. why yes...yes i did just make that connection. anyway, our kitchen still needs painting (uhhhmmm, husband!) to complete it's look, but 'tis the next room on the list. look out for before and after pics coming soon. alright, leave a comment(and your email) for a chance at winning the waffle maker...just imagine breakfast in bed on saturday morning. sighhhhhhhhhh...is this a folger's commercial? I'm confused... Are you doing sponsored give aways or just feeling extra nice? I love the chalkboard paint! I can picture it in my new house! i wish i were that rich! no, the giveaway is totally sponsored. 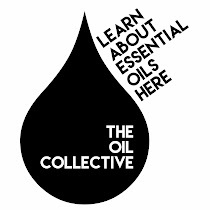 can i enter in my own giveaway? in my dreams. ha. Oooh I want a waffle maker! This increases my chances of getting breakfast in bed. i just used a mason jar for a flower vase and have been obsessing over how cute it is...i'm totally going to get more now and use them for glasses. yet another brilliant idea that i'll pretend is mine! 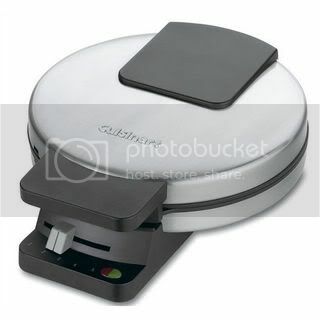 A waffle maker has been on my list of "things that would be fun to have" - hopefully I'll win this one! Cute - Both the glasses and the chalk board. (I truly hope that my labor will be as easy as painting a chalkboard) I'm seriously envisioning a smaller version for my kitchen - oh the projects that I will begin when I become a stay at home mom this summer! PS Am I officially entered in your drawing now? We use those same jars for! Over the years Alex and I have "collected" them from a specific restaurant we go to sometimes. Stealing you say...I just like to think we are helping out the dishwasher. Not as many jars to wash! Ha, and BTW, don't enter me into the drawing because I already have a waffle maker, and well, that just wouldn't be fair! So tell again me how you got selected to do a sponsored giveaway! 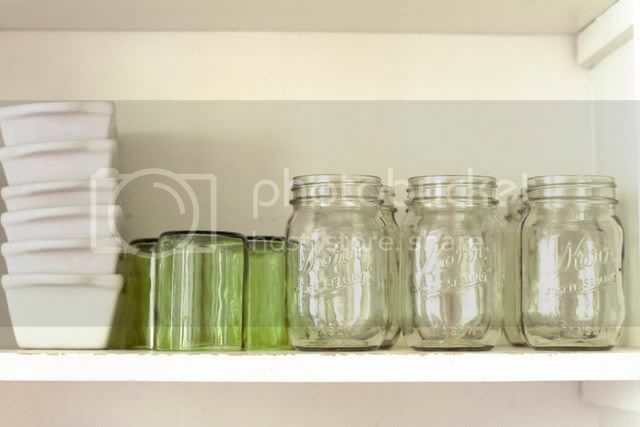 My grandma used canning jars for drinking glasses also. You may have started something. Bet I can find them for less than ten bucks! okay, i was just talking to mr. anderson last night about how much i needed a waffle maker (i have found the most fabulous and healthy waffle/pancake recipe). come on...i need this...i have 4 kids who all eat VANS waffles every morning (okay, kohen doesn't eat them quite yet---but milo eats enough for 3 kids)...and those waffles are expensive! i need this. badly. but, because i'm your BFF, you probably won't pick me...that wouldn't be fair to all of your other glorious readers. but i need this. and you know how poor we are, and the extra, ahem, expense we shall be enduring soon. i need this. okay, clearly i should win now that i have the longest comment. and i'm so ashamed to call hannah a friend...stealing glasses from a restaurant? how dare they. `i heart waffles. i heart drinking jars. i heart chalkboard. and i heart you! 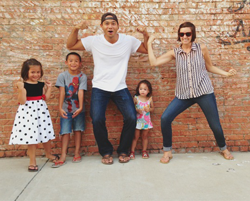 Oh, and when are we invited over for sweet tea?? :) Oh yeah, that's right...when my child stops being a cry-baby!! Sorry about yesterday, I wasn't kidding when I said he was tired...he fell asleep at the table while he was eating his lunch. How fun a waffle maker! I think Emma and Brian would be getting the benifits of that, not me in bed!! Ok, I am LOVING your chalkboard wall! Please come over.... ☺ and I too have a crush on mason jar. I fill them up with flowers all spring and summer. Arle asks me to make waffles all the time, but I can't because I don't have a stinkin' waffle maker. I NEEEEEED this. And, btw, LOVE the jars. It reminds me of home. I've wanted to do that, but never have for some reason. I was just thinking in the grocery store this afternoon how much I would love to have a waffle iron! I make wonderful pancakes, but can't make waffles because I'm iron-less! I would love to win this! I have two giveaways going now, stop by and enter!! i am pregnant. i heart carbs. I LOVE the chalkboard wall. I am going to do this in our new house. And, guess what, I use those kind of jars to drink out of too. We are SUCH kindred spirits! ok - enough from me. Hope you've taken care of the 'dark solids' situation!